Best for knowing your flight has been delayed or cancelled before the gate agent does. Best for anyone in the US, UK, France or Canada who has to pick up guests at the airport. Best for people looking to make good use of their layover in an unfamiliar airport terminal. GateGuru (free, iPhone/iPad; Android; Windows Phone coming soon) offers the most comprehensive database of airport businesses and services – such as restaurants, post boxes, and bureaux de change — spanning 191 airports, 100 of which are in the US. For each terminal, the app identifies which services are available before or after passing through security. The iPhone/iPad version of the app also allows you to check-in for your flight and will alert you to any changes in gate, take-off time or arrival time. One drawback: detailed, gate-level maps aren’t yet available for many important airports, such as in Helsinki, Dubai and Incheon (South Korea). Best for having your frequent flier account balances within easy reach for spontaneous upgrades. When checking in, an airline may give you the opportunity to upgrade your seat by cashing in some of your frequent flier miles. Knowing whether you should take advantage of such an offer requires familiarity with your latest points balances, so it helps to have AwardWallet (free, iPhone/iPad, Android), a rewards-management service that comes in both website and companion app versions. Punch in your membership information just once for your various loyalty programs (airlines, hotel chains, car rental companies and credit cards), and AwardWallet will continuously fetch your latest points balances and expiration dates. Travel companies increasingly run cross-promotions, so it can be handy to have mile and point totals for all of your programs on hand. One downside to using this tool: Southwest Airlines and American Airlines prevent AwardWallet (and other similar services) from automatically updating your frequent flier information. Neither airline allows the app to automatically pull in new mile and point balances. Southwest lets you plug in your info manually, while American won’t even allow that. Best for getting the scoop on security checkpoint wait times before you arrive at the airport. In the US, the Transportation Safety Administration (TSA) bears the brunt of travellers’ frustration with the hassles of airport security. 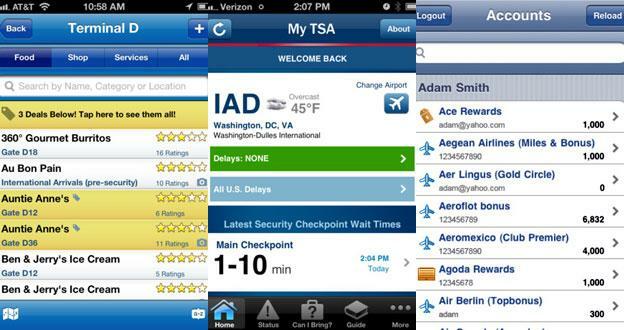 So the agency created the My TSA app (free; iPhone/iPad) to help fliers help themselves. The app’s “Can I Bring?” function catalogues 3,000 items and reveals whether each item is permitted in carry-on luggage. The Wait Times section offers a user-generated database of queue lengths at security checkpoints across the US. The app answers other questions, too, such as whether you can bring homemade pies through a security checkpoint (yes) and whether you can tote a spare lithium battery for your laptop in your carry-on bag (no). The app also includes weather reports and a national map detailing the major airports that are operating normally (coloured green) and which ones are plagued with delays (red). The TSA does not offer an Android version of the app.